Upon looking at photos of the June 30 anti-refugee protests, I was struck by the sight of the protesters holding candles. (Few candles can be seen in photos of the July 14 protest, but there was more daylight in those photos so that's not surprising). But it was not just the anti-refugee protesters holding candles - the pro-refugee demonstrators (below, left) also held them aloft. The reason for this, I think, derives from two different conceptions of what candlelight protests stand for. One understanding of them is that they are concerned with remembering victims and/or seeking justice. The first candlelight protests, in 2002, were to remember the deaths of two girls killed in an accident involving a US military vehicle. 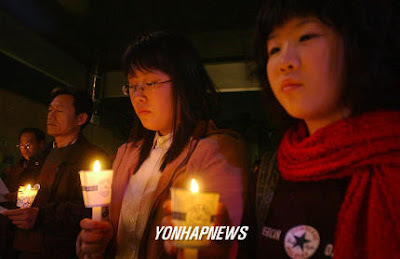 In November 2003 a small candlelight vigil was held in Daehangno as a protest against the suneung (CSAT) in Daehangno after a girl in Namwon killed herself on November 5, 2003. 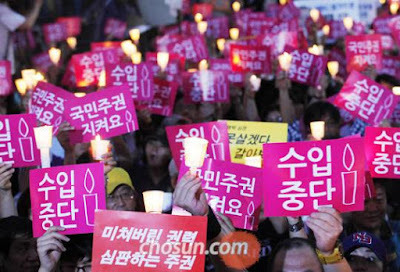 In December 2004, 150 people held a candlelight vigil to protest the police's failure to punish the scores of high school boys who repeatedly gang-raped two girls from Miryang. 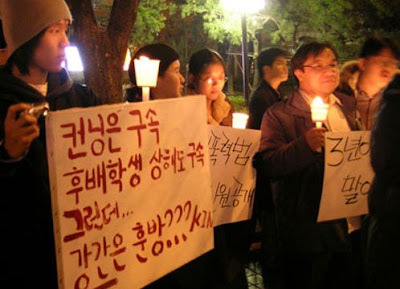 In May 2005 a "Remembrance Event for Students Sacrificed for School Education" was held at Gwanghwamun, which criticized the education system and the pressures that cause students to kill themselves. 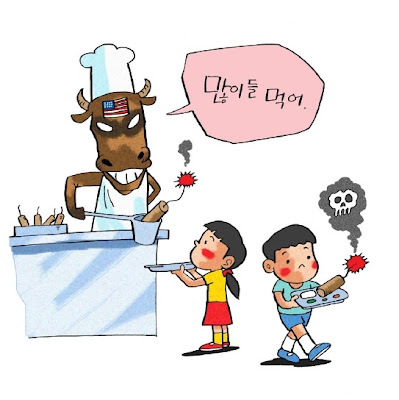 It is also popularly remembered that high school girls started the protests against American beef imports in 2008, fearing their lives would be cut short by mad cow disease. And the candlelight protests of late 2016 were described recently by Moon Jae-in as "an honorable civil revolution that inherited [the] spirit [of the 1919 March 1 movement]." With this justice-oriented pedigree involving support for the powerless, it's not surprising those demonstrating in support of refugees would be holding candles. But there is another, less savory side to the candlelight protests that should not be forgotten, one that reaches back to the first such protests in 2002. What is remembered as the "first" candlelight protest related to the girls was suggested by a netizen named Angma. 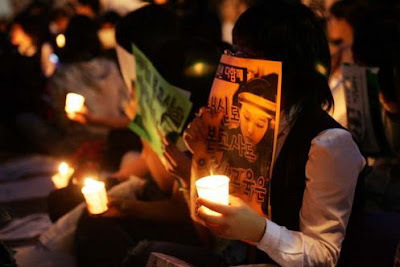 After watching an episode of MBC's current affairs program PD Diary about the acquittal of soldiers involved in the accident, he was so moved that he left messages on the internet urging people to "commemorate the lives of Mi-seon and Hyo-soon, who were forgotten in the joy of June" by gathering with candles near the US Embassy. These messages gained a great deal of exposure when they were covered by an Ohmynews reporter named Kim Ki-boh - who turned out to be Angma. 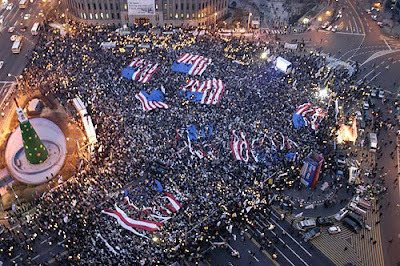 The candlelight vigil, claiming to be a "cultural event" rather than a political protest (and thus not subject to registration with the police), became a new form of protest that moved beyond the clashes with riot police of previous protests, and so became more likely to draw in a wider variety of participants. 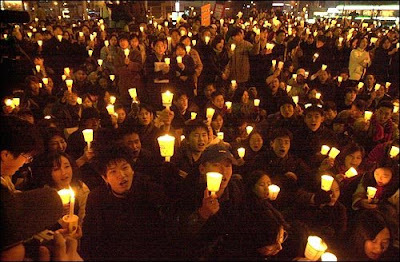 Things soon turned ugly, however, as this photo of a December 14, 2002 candlelight protest in front of city hall shows. Worth keeping in mind is the fact that two weeks after the accident that June, North Korean naval vessels attacked a South Korean patrol boat, killing six South Koreans. 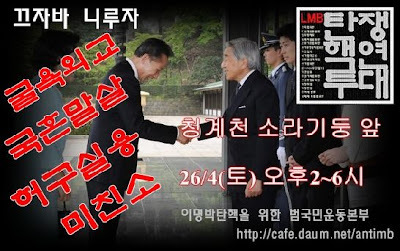 Little concern was shown about their deaths at the hands of North Koreans, in stark comparison to the reaction to the traffic accident involving US soldiers, which spread widely throughout South Korean society at the time. 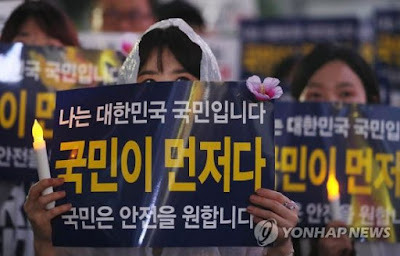 As well, far from being merely "cultural" in nature, when a coalition of civic groups took over the candlelight protests "The Pan National Committee said it would continue its protests until Dec. 18, the day before the presidential election." Roh Moo-hyun, the progressive candidate these groups favored, was elected the next day. The terms in red above include "disgraceful diplomacy" (for bowing to the Japanese emperor, as pictured), "obliterating the national soul," and "mad cow" (the announcement that US beef would be imported came on April 18). The rally's program was elsewhere described as "Reject the second colony." 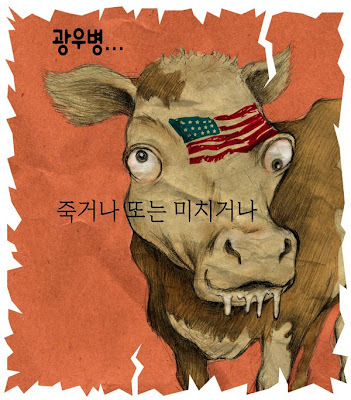 Though the April 26 rally drew only a small number of people, and farmers' rallies against US beef imports were only lightly attended, the issue exploded when PD Diary broadcast a show which shocked viewers and sowed fear of mad cow disease-tainted US beef. It soon became clear the program had mistranslated and mislabeled certain footage in order to achieve this effect. 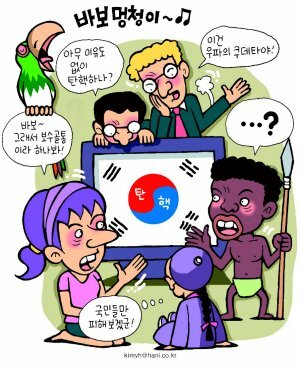 It also presented research in a misleading way to suggest Koreans were genetically more susceptible to mad cow disease, playing on a victim consciousness (of the "we've been invaded so many times" sort that Park Chung-hee encouraged during his Yushin dictatorship to inculcate support for a strong army) that finds expression in historical narratives and films. 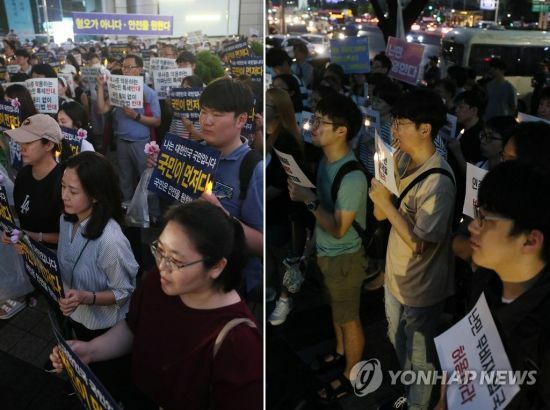 The candlelight protests that the group aiming to impeach Lee Myung-bak organized grew in size and continued for three months. For a critical take on them, Scott Burgeson's essay "Stranger in Chongno" is worth reading; he attended almost every rally during that period. He described the protests as an attempted coup e'tat and an "assault on Korean democracy by the forces of ideological totalitarianism and reactionary nationalism." Though the target of these protests was the Lee Myung-bak government, fear of outsiders - the US, once again - who would do harm to Koreans was used to rally the public to the side of those organizing the rallies. 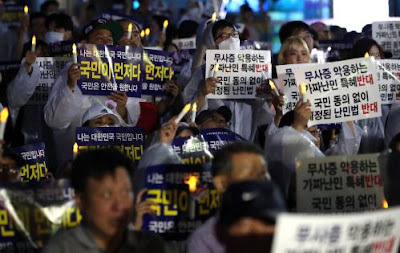 It should be clear enough from these examples that, from the beginning, candlelight protests have promoted, at best, a "we must protect the nation" brand of nationalism, and at worst, outright xenophobia of the sort that perceived outsiders - particularly Americans in 2002 and 2008 - as wanting to harm Koreans. And so it should be no surprise that those taking part in an anti-refugee protest would be holding candles, since the partisan, political candlelight protests of 2002 and 2008 promoted sentiments that were rather similar to those of anti-refugee protests. In many ways, candlelight protests, at least when the cameras are rolling (as they were not during the after-hours violence in 2008 that left hundreds injured), are an improvement over the violent confrontations of the past. But considering the way they have been used to express nationalism and fear of outsiders such as US soldiers or American beef exporters in the past, we should not be surprised that citizens who believe they are defending the nation from outsiders who would do them harm (or who would use resources that should be set aside for citizens alone) would feel comfortable adopting this form of protest in the same symbolic space (Gwanghwamun, in this case) as previous candlelight protests. 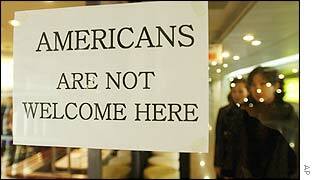 But the message on the signs above - "I am an ROK citizen. Citizens first. Citizens want safety" - points to a larger question surrounding the anti-refugee protests and past candlelight rallies - the role of the citizen in relation to the state. This question, revolving in part around possible changes to the constitution, will be the focus of the next post.